If you are thing about Hosting multiple or single website with server hosting software and web hosting Features like mail , ftp etc then you can get all in Vesta Control Panel and it is simple and web hosting control panel with amazingly simple and nice design control panel interface . Vesta CP panel have almost all features like MySQL, PhpMyAdmin, FTP, DNS and Mail Server etc . Vesta is free , open source based package but if you need more extra features then you have to check its commercial plug-ins like file manager and sftp modules . Users experience is good with this panel management like it fast and easy to use and quite good and user friendly .According to user reviews it look it best web hosting software . Here we are going to do installation of latest version of vesta panel , You can get latest version of Vesta Panel information before installing from its official website vestacp.com . Before proceed you should have proper root ssh access via ssh to connect your server . Now connect your server from root account or switch to root account. STEP 1 . Your operating system should be update properly before proceed , Here we are using CentOs server , so below are command to update centos server, you can use it for RHEL server also. After that we need curl packages to install for download vesta panel installer script from it source url. Run the below commands to update and install curl on centos / rhel . STEP 2 . Second steps are for download the installer script by executing below command. After that we will make downloaded installer script executable. STEP 3. Here we are going to do step 4 in two part . You need choose only one method . Method 1 is default and second you want to customize your packages according to your need. Run the below command to start installation. 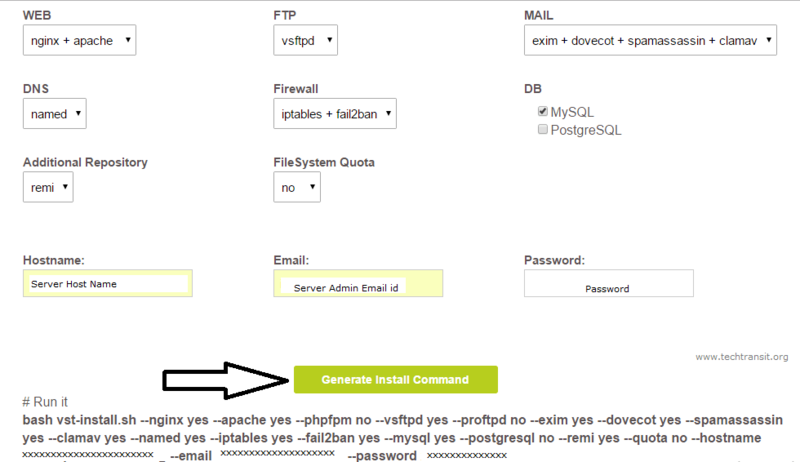 After executing above command and if you have done properly then you will get below output like below screen and then if you want to proceed put your answer in “y” and after that installer will ask for email address , you can insert there your email address . Here we are also going discuss some more feature like if you want to use your parameter on different configuration in packages like you want to install only nginx+apache with vsftpd ftp server , mysql server , dns then vesta control panel develop a tool in his official website vestacp.com to generate specific installer command. This command tool is in website “Advanced Install Settings” Section. Web : nginx + apache (2) FTP : vsftpd (3) Mail : exim + dovecot + spamassassin + clamav (4) DNS: named (5) Firewall : iptables + fail2ban (6) DB : MySQL ()7 Additional Repository : remi (8) File System Quota no (9) Hostname : Hostname of your computer (10) email : Your email id. (11) Password : Password of your server. STEP 4. At last after installer complete installation then it will show your Login details in the output. Please check properly at the end of installation. 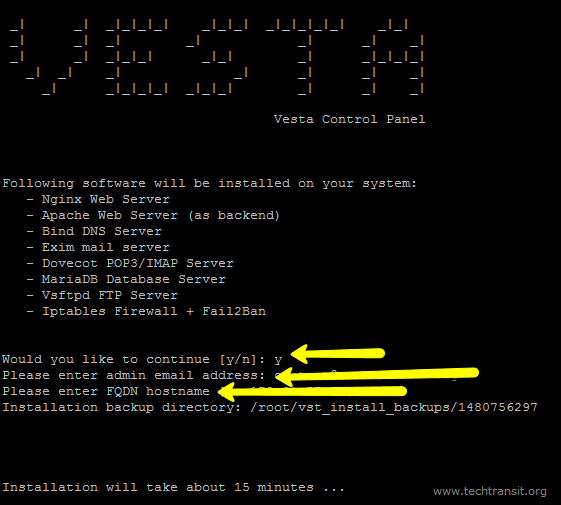 Now you can open vesta control management url.